Hmm…. In a virtual world of online casino, no one will notice what you will be wearing infront of the computers. So thats a total different story, but I do I wonder what I would wear if I was actually going to a casino. I would definitely drop the cocktail dresses or anything too flashy. Looking through my old references, with some luck, I found an old editorial “Bijoux” from Vogue Paris May 2011 for some inspirations. Looking at the shots, I fancied the styling of the jewelries, crisp edges of white shirts, sleeve-buttons and those elegant bow ties. Anna Selezneva’s eyes were filled with confidence and had a demanding yet calm expression. Looking chic will boost up your braveness and its they key to gambling. 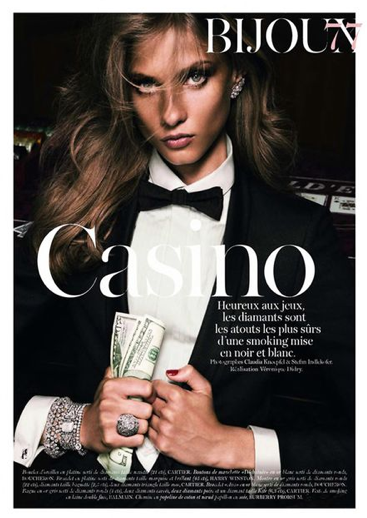 A women playing blackjack in Tom Ford with dazzling jewelries is certainly a winner in the fashion world! Tips: Remember to have nice manicures!!! It’s so important for females to have nice presentable hands, especially on the gamble table. Everyone’s attentions will be on your hands while you are placing your bet.